Buying American is not something we automatically think of when we shop for coffee. We are conditioned to buy Colombian or European coffee (“Vienna roast”, “French roast”). Yet America grows the best coffee in the world, right in Hawaii! Who hasn’t heard of Kona as a premier coffee growing region? There are of course other coffee growing regions in Hawaii on the other islands as well, especially Kauai and Maui. 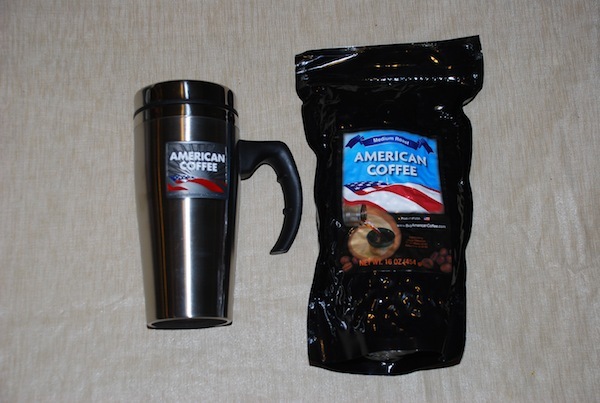 I was recently contacted by Chris Jasper from BuyAmericanCoffee.com to review their coffee for the Made in USA Blog. He is a coffee roaster that works with local growers in the Kona region of the Big Island of Hawaii. I have to say that this is one of the most dedicated people I’ve spoken to, in the buying American arena. He meticulously sources every possible item he sells from the US. For instance, he even tried getting Made in USA coffee mugs, but after looking through numerous suppliers, could not find a domestic steel travel mug. However, Chris did get a custom-cast pewter American Coffee logo by a foundry in Wisconsin to go on the coffee mugs! So this man really tries! I wish we all tried that hard. I sampled the dark roast Kona coffee that Chris sent. It really is quite excellent. I am a big coffee drinker and am very picky, and I have to say that this is the best if not close to the best coffee I’ve ever had. There’s something very rich and almost, dare I say it, volcanic?, about the coffee. It’s a real pleasure to drink and at $17 a pound for Kona, it’s the best price I’ve seen. Even Trader Joe’s sells Kona coffee for more. So check out BuyAmericanCoffee.com and hopefully you will be converted to getting your coffee domestically in the future!